Is There A Point To Deodorant? Then, I asked them if body odor wasn’t considered offensive, if they would wear it. The answers were a general probably not. But that time of year is now here. The sun is shining and you just want to do all the outside things. But with warmer weather comes your warm weather routine and staple – your deodorant. But is there a point to these sweat sticks? Should you pick antiperspirant or not? Is it harming your skin or your health? 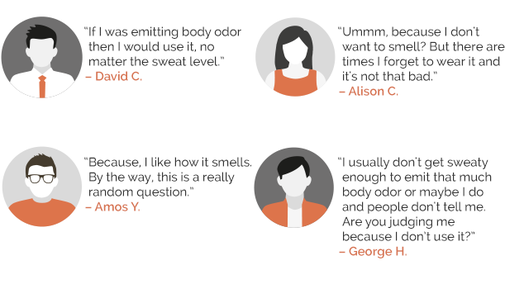 Do we live in a pro-deodorant world? Let’s break it down. Real quick, grab a q-tip and check the consistency of your earwax. Based on a gene called ABCC11, your q-tip might show either dry or wet earwax. Not all earwax is created equal, people. I have the dry, flaky kind, and for a while, I thought that is how all earwax was supposed to look. According to a 2013 study, researchers found that people who have dry earwax do not have a chemical in their armpits that cause underarm odor. According to the study, while only 2 percent of Europeans did not have the chemical, most East Asians and nearly all Koreans lacked the chemical producing gene. What does deodorant do exactly? Deodorant kills the odor causing bacteria that break down the sweat on your skin. Antiperspirant deodorant does double duty by reducing underarm sweat and masking odor. Aluminum is the active ingredient in antiperspirants and they work by acting as a plug to stop the flow of sweat. It might seem like antiperspirant deodorant is the way to go, but there is some research that talks about the negative health effects of these products. Some research has shown the skin might absorb the aluminum in antiperspirant, this being the possible cause to breast cancer. There have also been studies that beginning underarm hygiene habits before the age of 16, that is shaving and applying antiperspirant, which show a link to breast cancer. However, the research remains inconclusive. Overall though, plugging your sweat glands to stop sweat doesn’t seem like a natural thing to do to your body. There have also been findings that you build resistance to antiperspirant over time, so you may have to switch up your antiperspirant deodorant every couple months. Once you’ve determined the consistency of your earwax, and doing some self-smell tests, you can decide for yourself if you want to continue using deodorant because you like the smell, or use antiperspirant to control your sweat. Keep in mind that you may be able to skip a whole step in your morning routine, if you’re one of the lucky ones, and those who are not able to, remember that sometimes, it’s okay to embrace your sweat and your smell – as these are normal processes of the body.